We are an approved Certass installer and have supplied our leading range of replacement UPVC windows to many satisfied customers in Rumney and Cardiff. Our quality replacement UPVC windows are available in a wide variety of style options, ready to tailor to your unique specifications. Our Certass accreditation ensures only the best in workmanship and product quality, which means that once you use our uPVC replacement service you won’t be needing it again for a very long time. Our local, Rumney based double glazing company never pressure sells. Instead, we believe in an open and honest service where all appointments are informative and concise. We have over 15 years experience in the double glazing industry and have built a wealth of accreditations. You can choose our UPVC replacement windows with confidence. Get the very best double glazing deal with our competitive double glazing prices. We offer unbeatable window prices, with a price match guarantee. We offer free, instant double glazed window prices on our website courtesy of our quote calculator. Start your window quote today for a unique replacement window cost. At Inspire Windows, we offer the leading UPVC window profile by Rehau. This revolutionary double glazing profile provides superior efficiency, security and design. 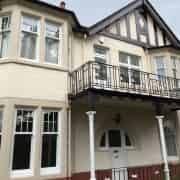 We only offer our customers the very best double glazed windows in Cardiff. From casement windows to sliding sash windows, we offer both traditional and contemporary designs. 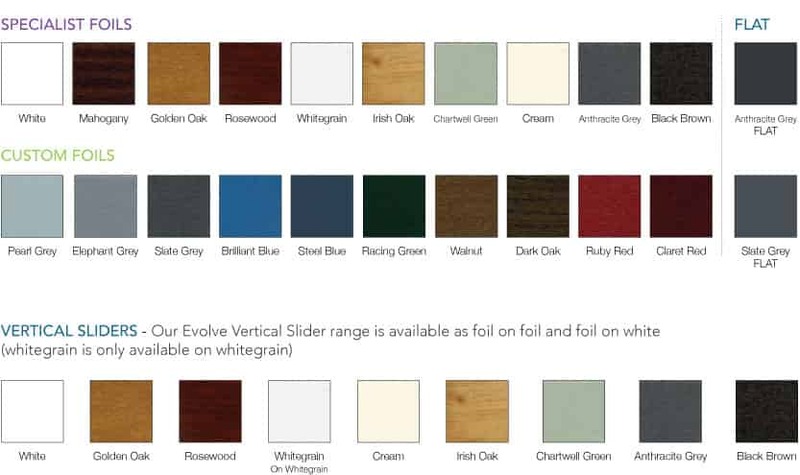 We have an extensive coloured foil selection which is available across our range of UPVC replacement windows. This includes specialist foils and custom foils. All colours are foiled on the outside and white on the inside. However, ‘foiled on both sides’ is available upon request. Why Choose Our UPVC Replacement Windows? Our Rehau UPVC window systems offer a comprehensive range of replacement window styles and finishes suitable for all types of property. They offer exceptional levels of energy efficiency as well as attractive aesthetics. Home security is very important and is something here at Inspire Windows, we take very seriously. Our UPVC replacement windows ensure that your home’s safety is never compromised, with reinforced chambers and internal beading. Our replacement windows are virtually impossible to break in to. Each UPVC window comes with state of the locking systems which are certified by the Secured By Design police backed scheme. Go green with our fully recyclable double glazed windows. Our UPVC replacement windows are manufactured using sustainable materials. This not only helps your home to contribute towards a greener environment but helps to reduce your carbon footprint too. Our replacement windows are extremely low maintenance. Made from durable UPVC materials, they are highly weather resistant and will never rot, warp or require re-painting. Designed to provide beautiful long lasting aesthetics, you won’t find better value or quality. Contact us to find out how we can help you achieve the perfect windows for your home, talk to one of our double glazing specialists on: 02920 734573.